Can you guess who this is, and or when it was taken? Good luck! 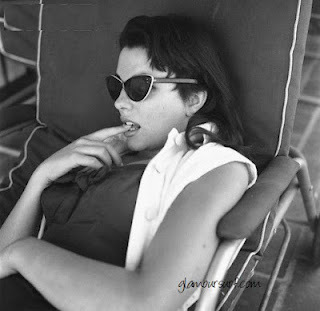 Update, photo was taken 1955 and is Joan Collins. 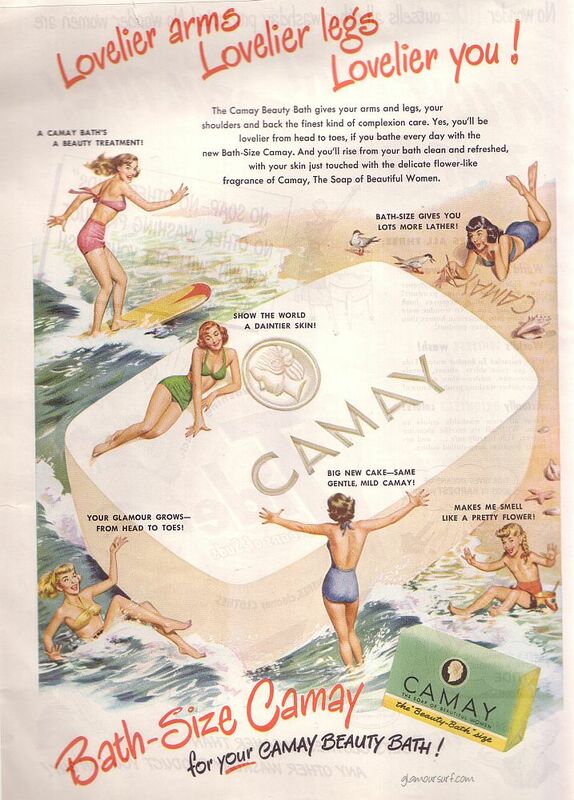 These ads from Camay are from the late 1940s. I wanted to share them with you as the illustrations are just too darn cute. Take me away! Here's a recent twist on vintage swimwear decor for the home.Garnet Hill is offering these cute percale sheets for your bed or a shower curtain for your bath. Fabulous right? 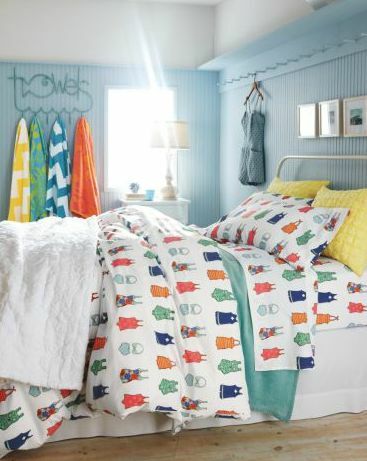 "Our retro bathing beauties are printed on a bright white ground of percale to create a vintage look that goes swimmingly with solids. 200 thread count combed long-staple cotton. Fitted sheet is fully elasticized for a better fit. Imported." 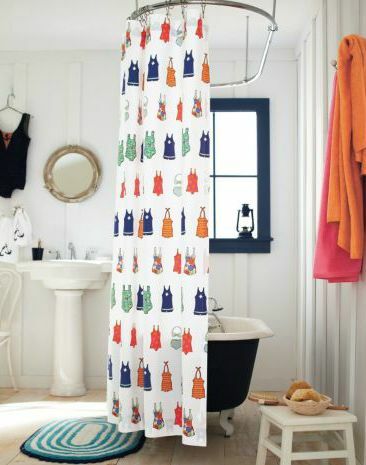 "Synchronize your bath's look with retro bathing suit motifs, borrowed from our percale bedding and printed on a white shower curtain. 100% cotton. Buttonholes for hanging." 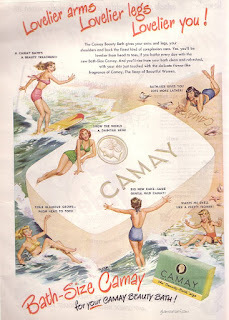 Look also how they've used actual vintage swimwear to hang on the wall. Not framed but on a hangar, (and please not a metal one.) But it's a cute idea, and I love the print they have created. Another tub I want a good soak in! It happened again. I get just a tad bit distracted from what I originally was going to write about because I come across something that I want to share with you. And it's happening in Australia, Melbourne to be exact. Just another reason why I really need to go. Someone, please send me a plane ticket! The Bendigo Art Gallery has a show up called Grace Kelly Style Icon. When people think of Grace Kelly (1929-82), one of the most photographed women of the 20th century, what they usually recall is her beauty and elegance. 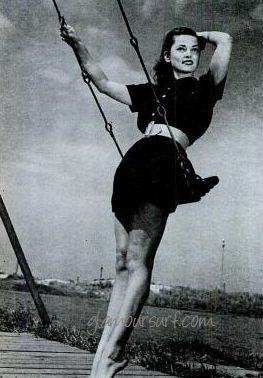 She rose to fame as an actress in the 1950s, starring in films by Hitchcock and others. Her image was cultivated by the movie industry, which fed cinema-goers' growing appetite for pictures of glamorous stars through magazines and newspapers. Grace Kelly: Style Icon will highlight the spectacular wardrobe of Grace Kelly and examine her glamorous Hollywood image and enduring appeal. 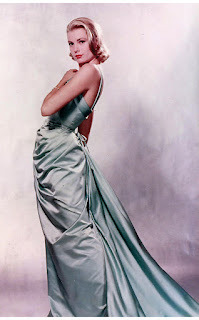 The exhibition features dresses from such films as High Society as well as the gown she wore to accept her Oscar in 1955. It also explores the evolution of her style as Princess Grace of Monaco, from her extensive wedding trousseau to her haute couture gowns of the 1960s and 1970s by her favourite couturiers Dior, Balenciaga, Givenchy and Yves St Laurent. The exhibition will be on display exclusively in Australia at Bendigo Art Gallery. Grace Kelly: Style Icon is organised by the Victoria & Albert Museum, London and the Grimaldi Forum, Monaco. One of the gowns on display is the iconic Grecian knockout, designed by Edith Head, which Kelly wore to the academy awards when she received an Oscar for Country Girl in 1955. Talk about Red Carpet! OK, if that's not enough there look to be some fabulous Grace Kelly Exhibition Experience packages. I'm talking seeing the show, going around vintage shopping in a chauffeur driven car no less. Or perhaps the Grace and winery tour? A bit off topic but I do sometimes like to share my food discoveries with you all. 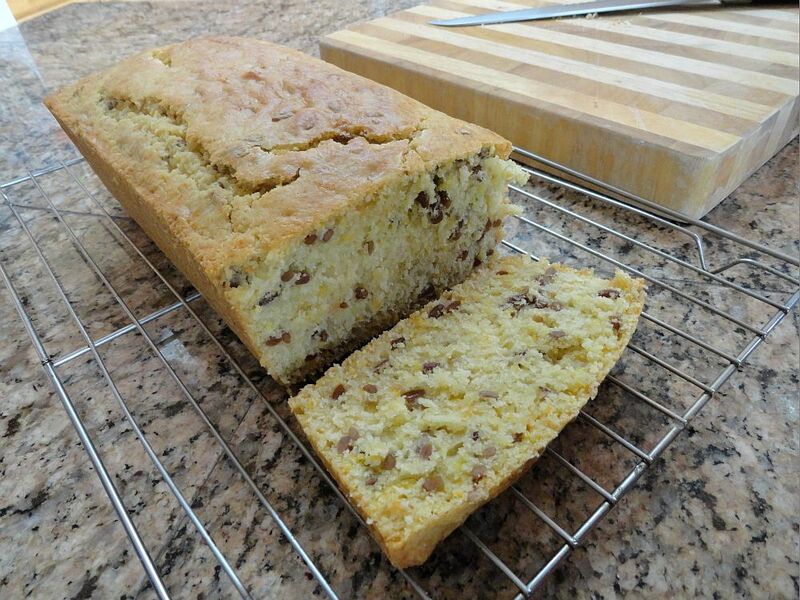 This morning I looked in the kitchen and decided to try a new recipe for Orange Sunflower Seed Bread. I don't typically like orange flavoring in most food, but this bread sounded scrumptious, I had all the ingredients on hand, and my tummy was hungry. It came out very good, not too sweet and the sunflower seeds gave it just the right amount of texture and roasted nutty flavor. Sift dry ingredients together. Combine egg, orange juice, orange peel, milk and melted butter; add to dry ingredients, mixing well. Stir in sunflower seeds. Pour into greased loaf pan and bake for 1 hour, or until toothpick put in center comes out clean. Cool on rack 15 minutes before removing from pan. Wait until bread is completely cooled before slicing. For easier slicing, coarsely chop sunflower seeds before adding them. After making it I took a slice and used some Cornelian Cherry Preserves we recently purchased. The preserves were made with just fruit and sugar, but we didn't see the fine print that it still had the seeds! so took some time yesterday to rescue what I could and drained the cherries from the preserves and took off as much of the fruit as I could. The cherries are small and have a larger pit like an olive. I managed to salvage about 3/4 of the jar. Who wants pits in their preserves? Which all led me to look on line where I came to discover that the cornelian cherry is not a cherry at all but the fruit of a dogwood tree, so a dogwood berry. Cherry or Berry, I really like this preserve and suggest you try it along with this recipe for orange Sunflower Bread. Happy Friday! Who is she, anyone know? I'm kinda of curious about this photo. It's stamped on the back and was taken by Philippe Halsman. I'd bet that is a Claire McCardell swimsuit she's wearing. 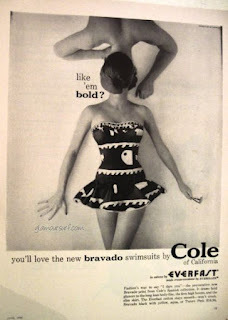 Claire launched what was called the Diaper Swimsuit in 1942. 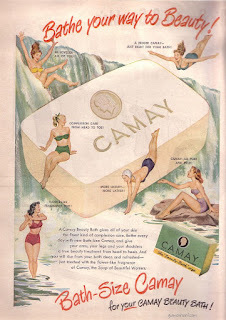 I want to say this picture is earlier that the 1950s attribution it's given. So maybe identifying the model would help. Anyone? "A BEACH SIDE SWIMSUIT BEAUTY AS ONLY COLES PHILLIPS'S IMAGINATION CAN BRING TO LIFE. SHE'S A LONG LEGGED LASS IN A BLACK WOOL SUIT WITH VIRTUE PLUS FASHION ON HIGH AND ADVERTISING MENNON TALCUM POWDER AT THE BEACH. THIS FAIR SKINNED BEAUTY IS MAKING THE BEACH BUMS SWEAT BIG TIME AND HER MAID IS READY TO PROTECT HER FROM THE MUSCLE BOUND SWEETHEARTS WHILE THE CAPE HIDES HER FAIR SKIN FROM THE SUN. NICE STRONG PHILLIPS COLORS ALTHOUGH THERE IS NOT MUCH SHOWING ON THIS GAL WITH THE HEAD TO TOES BLACK WRAPPING." "The original piece was by an artist named Cole Philips, very well known for his knock out beauties and his most famous "fade away girl. 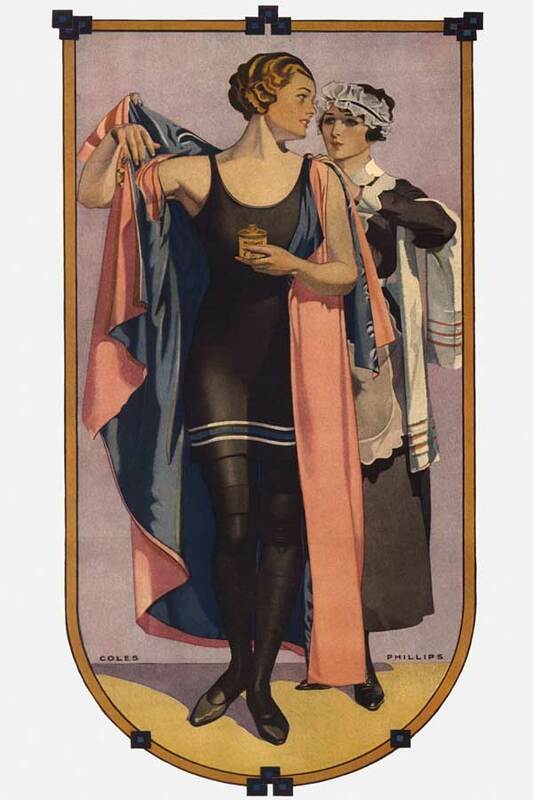 This PosterPrint was brought to life from a 1914 Mennen's talcum powder advertisement. The original is quite scarce as it was used as a back cover ad so most did not survive without much dirt or damage or both". 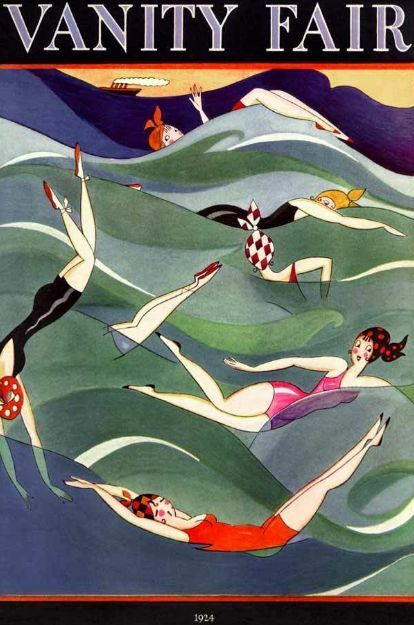 But wait, there are many more vintage swimwear posters to choose from too, perhaps you'd like something like this Deco piece done by in 1924 by Vanity Fair house artist "Fish". Oh lordy, off to make some room on my walls. 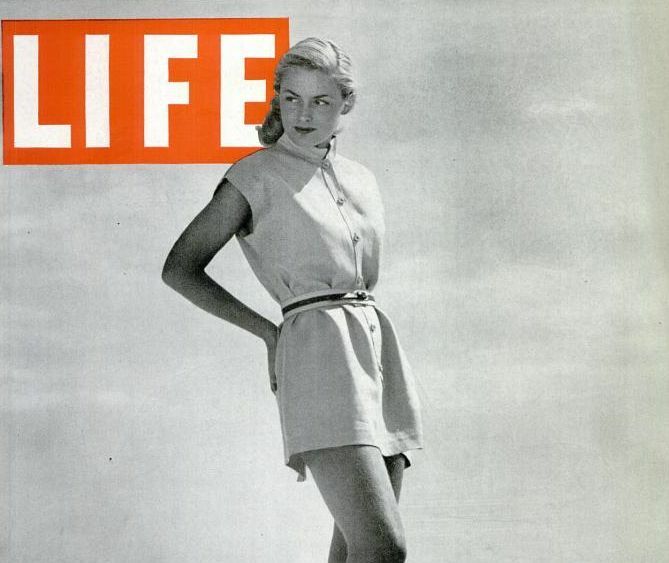 New Brief Skirted Sports Outfits Threaten Popularity of Shorts. For sunbathing and playing near but not in water, these new short play dresses are as cool and comfortable as shorts but more flattering. The shortest skirts every seen anywhere except on little girls and ballerinas, threaten this summer to become more popular than short for active sportswear. For young girls and women who like to play tennis, badminton, ride a bicycle or loll in the sun, two New York designers, Carolyn Schnurer and Joset Walker, have made new playsuits which they calls "skimps", "topalls" or play dresses. 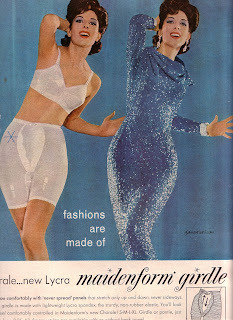 Whatever their names, they are really variations of the classic two piece. The old playsuit usually consisted of a top and shorts in one piece, which could be worn either alone or with a separate skirt. 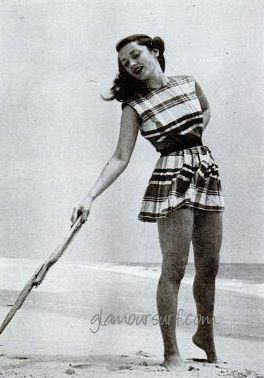 In the 1946 Playsuits, the one piece part of the outfit is a top-and-skirt, which can not be worn alone but must be worn with a pair of pants or shorts, preferable matching. Mostly made of cotton with pleated or circular skirts, they are good for sports, but too heavy for swimming. Black "SKIMP" by Joset Walker, 1946, is exactly like a street dress except that skirt is 8 inches above the knee. It has sleeves, a small collar, with button and pleats down the front. Plaid cotton in red, black and white is used for this little dress that buttons down the back. 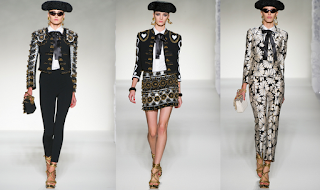 Carolyn Schnurer calls these outfits "skimps". I share these with you today as I thinks there some great info here and the fact that Joset Walker is featured is always a plus in my book. All of these fun images are from Ladies Home Journal Christmas Edition December 1970. 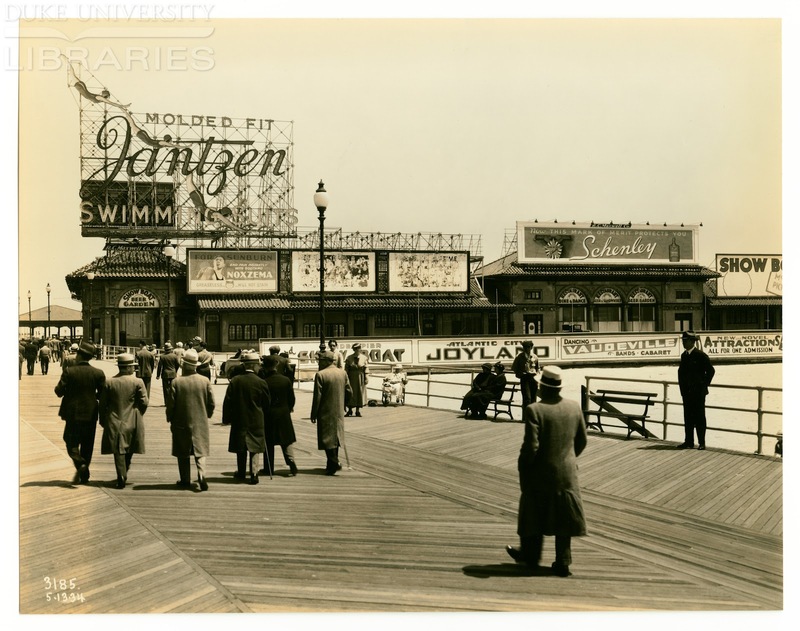 We scanned a small selection to share with you today. Remember these?All those fun glittering close fitting crochet caps, just perfect over your long billowy tresses. Two braids entwines with gold ribbon complete the face framing. The Peasant Treasures - along gold knit dirndl dress is gathered at the neck by a drawstring. 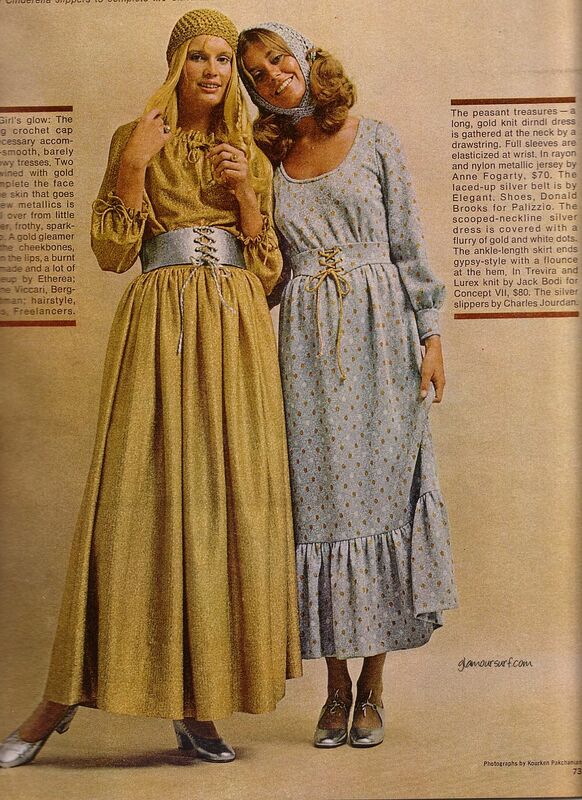 Full sleeves are elasticized at the wrist, in rayon and nylon metallic jersey by Anne Fogarty. $70.00. The laced up silver belt is by elegant, shoes by Donald Brooks for Palizzio. the scooped neckline silver dress is covered with a flurry of gold and white dots. The ankle length skirt ends gypsy-style with a flounce at the hem. In Trevira and Lurex knit by Jack Bodi for Concept VII, $80. 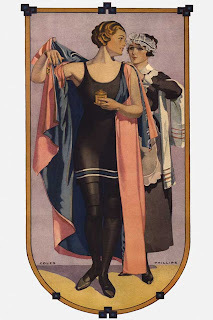 The silver slippers by Charles Jourdan. And Cybill was making a definite appearance. 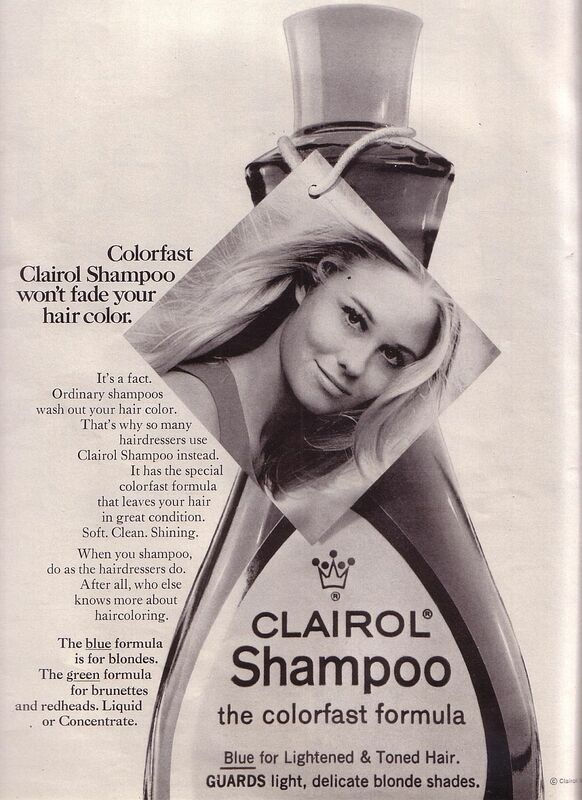 The ad is actually for a Clairol underarm shaver. Because Girls are Curvier Than Men. HA! Here she is again in yet another ad for Clairol just a few pages back from the first. This ad towards the back made me smile, Sauna Shorts! Doesn't say what awful material they are made from, but they inflate! And they could be yours for only $9.95! And finally just because ya gotta have some swimwear, we wrap it up with a picture of Cybill in a bikini. Happy Friday everyone, have a fabulous weekend! 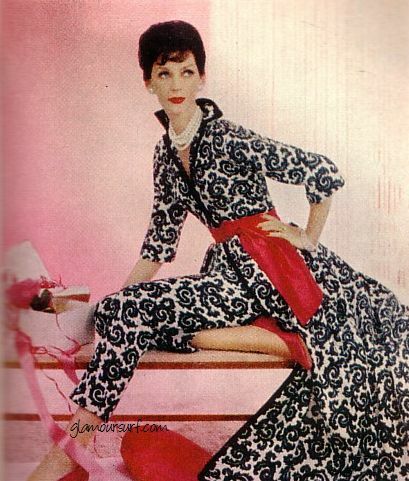 This image is from an article called "Look Beautiful at Home" from a 1959 issue of Ladies Home Journal. The article states that you can even sew this at home! This very glamorous pajama fashion can be made for under $8.00. 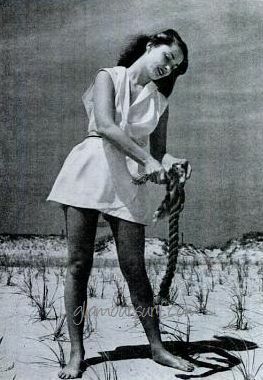 It is black-and-white cotton bound with cotton braid. The one piece trouser-shirt combination is topped by a gathered overskirt. Pretty with accents of red. Vogue Design 9898. 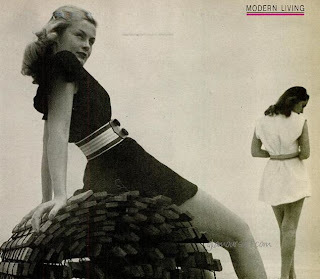 One piece slack suit and skirt. sizes 10-16. 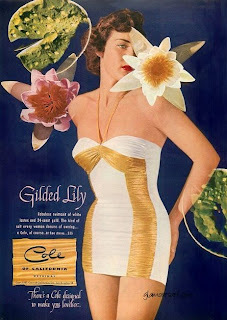 I did find an image of the pattern on the vintage pattern wiki, but no links to any sources where one may find this particular pattern. Just my luck. Anyone have one???? I feel like lounging, err, looking beautiful. 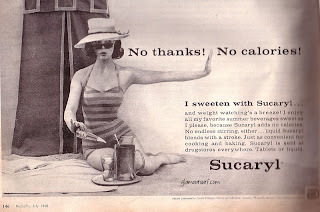 I've been scanning some ads 'n things from some old magazines I found this weekend on one of my treasure hunts. These particular ones are from McCalls March 1963. 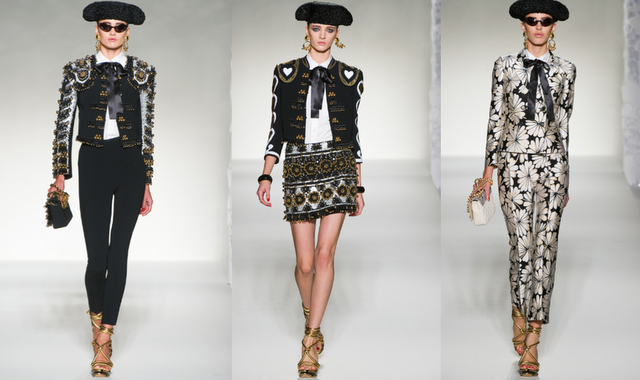 Fashion action starts when you wear these western cotton knits. Taos denim jacket $7.98 and britches $5.98. BRITCHES! There's an old fashion term you don't hear used too often, especially with the likes of Catalina. And here we have one from Maidenform, makers of bra's, girdles and swimsuits. This one is called the Chorale, comes as a girdle or pantie just $6.95, with long legs $8.95. All styles are available with or without back panel. Controls you comfortably, with 'never spread' panels that stretch only up and down never sideways. Just what every girl needs! Bust seriously, having the proper foundation is very important when wearing vintage clothing. It helps to make everything fit appropriately. 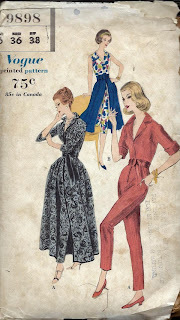 My sister Jody of Couture Allure has done a fabulous informative blog post on the subject of having your vintage clothing fit correctly with the proper foundations. We'll be having fun with these scans all week, be sure and check back ya hear! Today I'm sharing an ad from 1960 with you because it has a fabulous swimsuit in it, right? Right. But the message is deadly in my opinion. Be careful when consuming things like this with additives that have yet to be proven healthy. 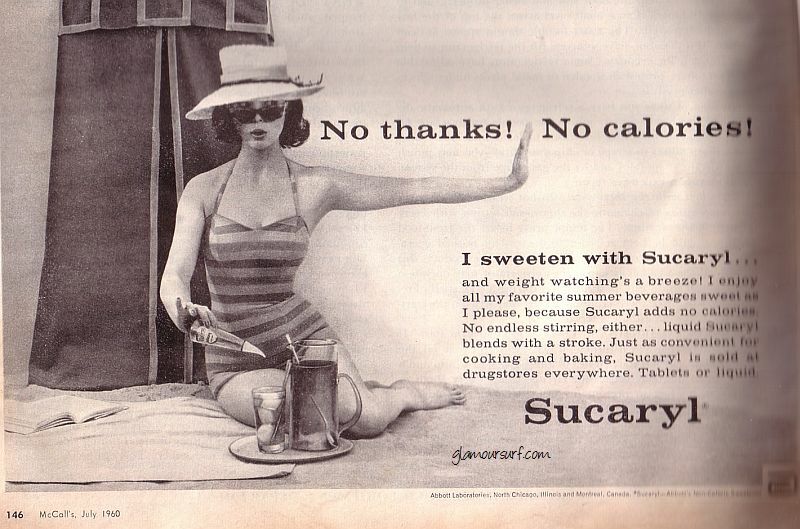 This particular product Sucaryl is still being produced and sold but has been banned in the USA since the 1970s. Ugh is right. Don't fall for it people. Stay healthy. Try and eat foods as natural as possible. Less additives the better. Go organic, grow your own food. This is one gals opinion. 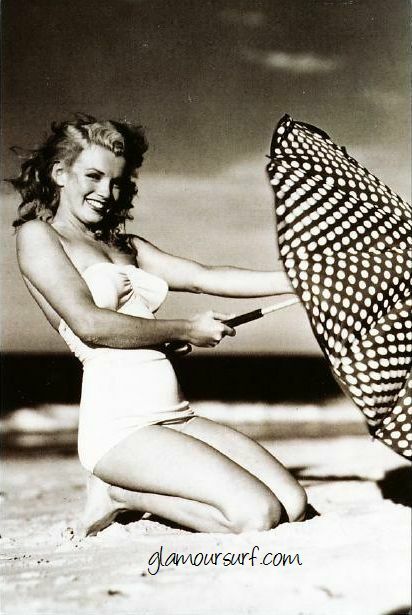 This is an early image of Marilyn, perhaps when she was still known as Norma Jean. Sweet! 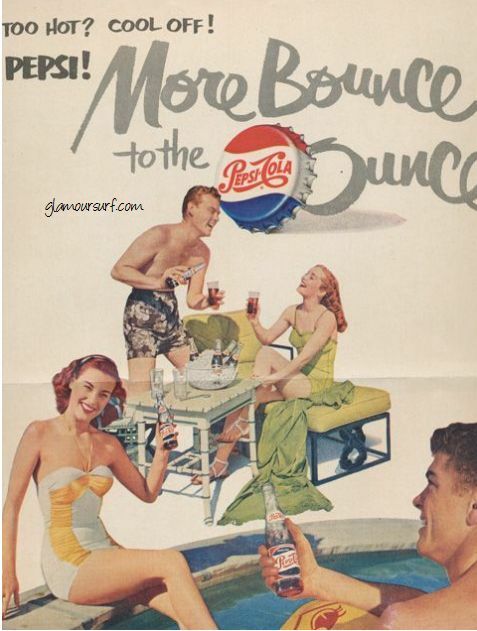 I was tickled to find this Pepsi ad, More Bounce to the Ounce from 1951. Isn't it fun? 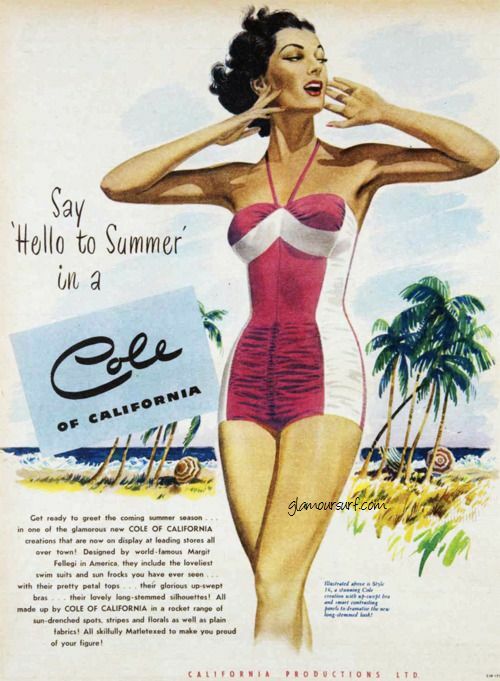 And to add more interest, I spy the Gilded Lily swimsuit from Cole of California represented in the ad. Wondering if Cole had a relationship with Pepsi, anyone know? And then to top it off I found another color wave, in the same suit. How cool is that? And the gorgeous Janet Leigh in the same suit. Hubba hubba. Happy Thursday all!